Today I’m welcoming Kim MacCarron to the party! Kim is a four-time YA Golden Heart nominee, and no wonder — her books are packed with emotional punch. What can I say about my critique partner Special K? A lot! She’s a wonderful author who writes about strong friendships, courage and love. And as a person, she epitomizes those qualities too. This is a woman who’s legendary for hauling a blender to a conference and making us margaritas in her room. A woman who bought me a Broadway ticket to Wicked and firmly said, “I don’t want to hear a word. Take it.” A woman who took a wrong turn on the way to Albuquerque and ended up in Roswell, where she quickly blended in with the locals. She’s fun. She’s cute. She’s the one and only Kim MacCarron. Hang out with Kim on Twitter and on her website. Vanessa, thanks so much for including me in your Paranormal Party Posts to celebrate the release of your debut, THIS IS YOUR AFTERLIFE. In keeping with the paranormal theme, I thought about writing about my experience with the Ouija board, but it gives me the heebie jeebies even after all these years. Instead I’ll tell someone else’s experience, which inspired me to write my own short story based on the idea. My friend had purchased a secretary at an estate sale or auction, but soon after moving the piece into the condo, strange things started to occur. A feeling in the room. A coldness. Creaking noises. She just felt something wasn’t right. Then the deadbolt started to lock her door at the exact same time every day—right before her husband was due home from work. This caused some irritation because he kept asking my friend why she kept bolting the door when she knew he was on his way. She couldn’t understand how this kept happening. Again and again. One day her husband called while on his way home, so she went to the door and double checked that the door wasn’t bolted. It wasn’t. She went to the sink to load a few dishes in the dishwasher, but turned off the water when she thought she heard a noise. She heard the distinct click of the deadbolt. She rolled her eyes, thinking her husband had used his key the wrong way, and he clearly had been doing the same thing all along. She walked to the door to confront him about his mistake, but there was no muttered cursing on the other side. She turned the dead bolt, opened the door, but nobody was there. Just as she was about to close the door, her husband stepped off the elevator. When she backed into the living room, she felt chilled. She told me later that she wasn’t scared so much as confused. What did it all mean? So, being a writer, I often wondered about this. Curiosity made me crazy. Why did the ghost always lock the door at the same time? Who was it? And why did he/she hitch a ride to her condo in the secretary? Wouldn’t he/she have felt more comfortable in a familiar place or with family members? Why stick with a piece of furniture and be at the whim of whoever bought the piece? My friend’s experience always stayed at the back of my mind. I’ve made up many little stories about why the ghost stayed with the antique secretary. Sometimes it was spooky. Sometimes it was a mystery. In the end, I made it into a romance. Wow, what a creepy story, Kim! Thanks so much for sharing it and your haunting short story, Just Believe. I wonder what secrets the previous owner held in that secretary! So, partygoers, how would you like to win a $50 Amazon e-card and a Kindle copy of This Is Your Afterlife? All you have to do is enter using my handy Rafflecopter giveaway mechanism right HERE. Have you ever experienced a haunting? Had an object or piece of furniture with a life of its own? Leave us a comment below! Join us tomorrow to mingle with another great YA author, Stephanie Kuehnert! I’m still celebrating my debut. (Hey, I’ve waited almost 20 years for this!) I am so lucky to have incredible writer friends who’ve each supported me during my writing apprenticeship. I hope you’ll stick around for the whole party season. Mingle with my friends! We’ve got prizes up for grabs, and there’s always virtual cake to feast on. Today’s very special guest is Erica O’Rourke, author of Dissonance (book 1 of a new series from Simon & Schuster) and the Torn Trilogy (K Teen/Kensington). I’ve always been in complete awe of Erica. We first met as YA Golden Heart finalists in 2010, and I was impressed by her kindness and wise counsel. She went on to win the golden necklace as well as a fetching fluorescent crown the rest of us YA ‘losers’ gave her. We share a love of cats, driving stick shift, and sushi. (Though, I’m still trying to get her to try the raw stuff just once***! Will you try sashimi if I hit the bestseller list, Erica???). ***Correction: Erica assures me she does like sashimi! I don’t know I thought otherwise all this time. Perhaps an Erica O’Rourke in an alternate universe isn’t a sashimi fan! Having spent time around people who are avid fans of horror, I have come to the conclusion that some people enjoy the adrenaline rush that accompanies mortal terror. I, however, am not one of those people. Faced with a trailer for a scary movie, I do not feel an adrenaline rush. I feel overcome with with the urge to curl into a little ball and weep uncontrollably. On Halloween, I openly scowl at the houses with the rotting corpses in the yard. When I drive by a haunted house, I hit the gas. I am a scaredy-cat, and I am totally okay with everyone knowing it. What terrifies me the most? Scary books. Books stay with you. Books are magical. Books have power. A well-written horror novel seeps into your brain and takes up residence there, hiding until you think the fear has dissipated. You feel confident, like you’ve finally a grown-up and Can Handle This. Growing up, the children’s section of our library was tiny, but it had a healthy selection of Christopher Pike and Fear Street. Desperate for new material, I went ahead and read them, and regretted it EVERY. SINGLE. TIME. Eventually, my book-induced insomnia forced me to create a new rule: No scary stories after 4pm. The hope was that I would forget the book in the hours between four and bedtime, allowing me to fall asleep without assuming a vengeful ghost was coming to slit my throat with a dull butter knife. Finally I gave up reading horror novels. I was safe. All was well. And then I went to see Silence of The Lambs. Crime is different than horror, I told myself. Hannibal Lecter might be evil, but he was still a man, not a demon or an evil spirit. To my surprise, I liked the movie very much. I liked it so much, I decided to read the book. Crime is different than horror, you see. Everything would be fine. Spoiler: Everything was not fine. Not only could I not sleep, I couldn’t stay in the house by myself. I was utterly convinced that Hannibal Lecter was going to come to life while my back was turned, climb out of the book, kill me in my sleep, and bust out the chianti. I hid the book in the basement. Every night. And the minute I finished it, I returned it to the library and swore off scary books entirely. Since then, I’ve read a few truly excellent-yet-terrifying, but nothing else has ever been relegated to the basement. Which is good, because in our current house, my bedroom is in the basement. Thanks so much, Erica! I had to keep my copy of The Amityville Horror out of my sight too! Paranormal party people, there are two prizes to win today! For your chance to win a $50 Amazon e-card and a Kindle copy of This Is Your Afterlife, give my Rafflecopter a shot. Click HERE. Leave a comment below for your chance to win a copy of Erica’s Dissonance! Are you a scaredy-cat? Can you read scary books after 4pm? See you back here tomorrow, when magical realism author Elizabeth Langston makes her grand entrance! Welcome, welcome to Day…um, how many days has my This Is Your Afterlife launch party been going on? Ah, yes, four days so far! It seems to me that paranormal activity wreaked havoc with comments on my old blog, so I’ve moved back here to the safety of WordPress. Sara doesn’t actually know this, but I credit her for helping me finish my first book waaaaay back in 2004. We were members of Romance Writers of Australia’s email loop. I whined about not being able to get past, oh, Chapter One, in my manuscripts. Sara responded by telling me about the Snowflake Method. It was like being inducted into a secret society for plotters. I stopped flailing around and completed my first (terrible) novel. Fast-forward 10 years, I’ve lost track of the number of books I’ve finished, and Sara still listens to my constant whining. But she also forces me to work hard and keeps track of my progress in a fabled ‘tick’ spreadsheet. Sara was the first person to read This Is Your Afterlife. Please give her a very warm welcome! I’m very excited to be here celebrating the launch of Vanessa’s book, THIS IS YOUR AFTERLIFE, which is amazing and I’m recommending to everyone. As the theme for Vanessa’s party is paranormal I thought I’d write about superstitions. 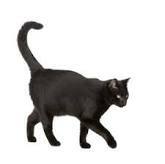 Most of us are superstitious to varying degrees and we are all familiar with superstitions like: don’t walk under a ladder; if a black cat walks in front of you it’s lucky; if you spill salt throw some over your left shoulder (or is it right shoulder? I’m never certain so throw it over both to make sure). But what about the more bizarre superstitions? There are some real doozies out there. I’ll give you a few examples. Don’t eat salad if you want to have children. Yes, it’s true. In the 19th century, men believed it could make them sterile. So if you’re out with a guy and he leaves lettuce on the side of his plate……..
Or what about: look out for a goat when you’re heading to an important meeting? It’s been thought that goats can absorb evil or bad luck, so go via the fields and hope you stumble across a goat when you’re heading to a job interview. Just make sure to avoid the poo as it’s not a good look with stilettos. Stay away from the lettuce, goat. There are also superstitions relating to defying age. Everyone wants to stay looking young, right? Well, don’t bother with all those expensive skin creams, just keep an acorn in your pocket. Now they tell me!! Anyway, thanks so much for inviting me to your book launch party, Vanessa. I know THIS IS YOUR AFTERLIFE is going to be a huge success. There are two separate prizes to win! 1. Click HERE to enter my Rafflecopter giveaway. 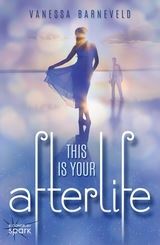 You could win a Kindle copy of This Is Your Afterlife and a $50 Amazon e-card. 2. What’s the weirdest superstition you’ve ever heard? Leave a comment below for a chance to win digital editions of Sara’s The Second Virginity of Suzy Green and Will the Real Abi Saunders Please Stand Up? Thanks for joining Sara and me today, partygoers! I’d love to see you again tomorrow — the delightful but easily spooked Erica O’Rourke will be with us.